With your first set of finals coming to an end, winter break is the perfect time to unwind from the school grind. You made it through your first semester as a freshman so now it’s time to reward yourself. You may be wondering how on earth you’re going to decide where you want to visit for winter break, the possibilities are endless. But fret no more because your questions have been answered. Punta Cana in the Dominican Republic is the magic spot! From white sand beaches to every outdoor excursion you can think of, from scuba diving to parasailing and ziplining to swimming with the dolphins. Drink all day and night on the beach or take some salsa lesson to impress your friends back home. Punta Cana has it all! Experience the island life the right way by visiting the beauty that exists in the Dominican Republic. 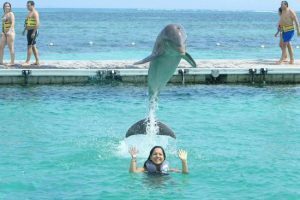 One of the most popular and exciting things to do in Punta Cana is to swim with the dolphins. They have multiple dolphin excursions that allow you to get up close and personal with the dolphins. From swimming with them side by side to feeding them a tasty fishy snack. You’ll have a new best friend to tell your family and friends about after this encounter you won’t forget. Your first winter break as a college student should be a memorable one. Punta Cana will definitely be a memory that’ll stick with you for a long time. Choose your vacation wisely!